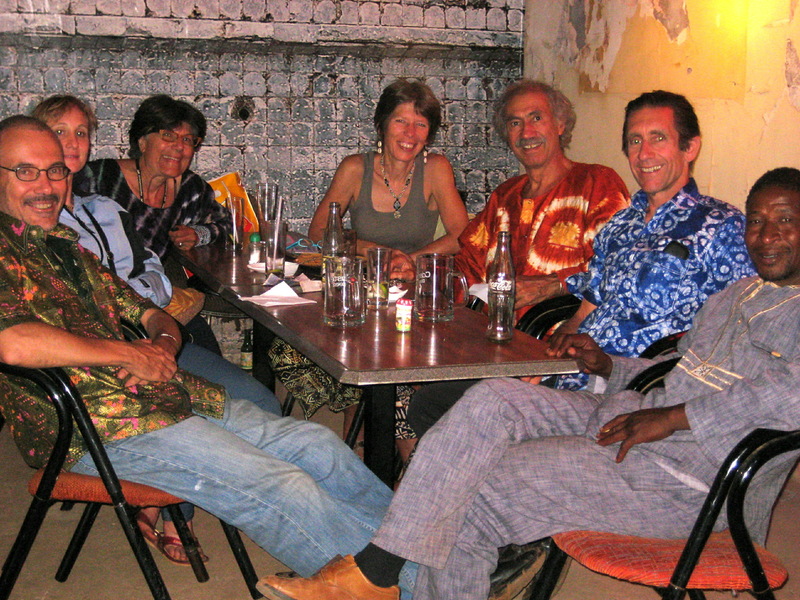 Wague, Larry, Hossein, Tami, Joyce, Deidre, and myself at “Bla Bla”, a Gabonese restaurant in Bamako. The food was simple but elegantly prepared. Many of the dishes were served on skewers with rice and fresh vegetables. My pork chops were very very good and there were plenty of them. No worries about lack of protein today! The building was typical for the area and constructed with a concrete post and beam system, cast in place concrete floor slabs at all levels, and mud brick infill for the walls. The place where we were sitting was in a part of the building with the roof slab removed and we were dining alfresco amongst the interior ruins. It was a brilliant response to fixing a broken building by simply removing the offending piece. Its the first time I’ve seen this type of design response in Mali. Between the quality of the food, the interesting surroundings, the good company and the balmy weather …. well, it was a nice night. I promise to blog about Timbuktu soon. I have nearly finished the writing and the pictures are uploading as we speak! Well, I was going to tell you all about Timbuktu in this next post. But, I’ve had food on my mind all day so I think I’ll tell you a little bit about what we have been eating here in the Bamako region instead. The food here is a bit different than the food further North. Up near Timbuktu and along the Niger River, there seems to be a clear distinction between the food items on your plate. i.e., pieces of chicken or fish, hunks of fried potatoes and/or plantains, and then vegetables or rice. Here in the South, the food can be better described as a stew, or as rice/millet/couscous/or ”grass seed” with sauce (“grass seed” is actually called Fonio; similar to Teff and is a very tiny grain). The sauces are broth based, with very little meat (and tiny pieces at that). Garlic, tomato, and peanut oil are used as flavor, and the sauce is generally teeming with cabbage, green beans, carrots and aubergine (African variety). The quantities made are huge, and large numbers of people can be fed with minimal amount of work. This is important, as shared meals are a way of life in Mali, as are unplanned guests where the visiting is done over meals and sweet African tea. So far, we’ve had “Tiga De’ge’ Na”, a peanut oil based sauce with chicken; “Jaba Dji”, an onion based sauce; and, “To’h, a red oil tomato or okra sauce with a green millet based dough (this is the national dish of Mali). Tonight, a bunch of us went out to dinner at “San Toro” a restaurant here in Bamako that is making a name for itself with organic, locally grown, indigenous food. The food was wonderful; fresh and safe to eat. The menu was set and we all had fresh fish salad and grilled , skewered El Capitan and veggies. I especially loved the fresh pounded ginger drink. It is just what it sounds like; pound/puree fresh ginger, sweeten lightly, and serve chilled. It does wonders for a pollution and sand scratched throat. The restaurant was in an old courtyard building made of mud bricks and plastered with a soft mud coating, painted brightly and festooned with local Mali art. Treated to Kora playing (24 strings and a gourd for a sound belly, it is a cross between a harp and guitar) it was quite the treat. My favorite dish so far? “Furu Furu” a millet based batter, drop fried into little pancake type things. They are delicious. If I understand this correctly, a rice custard is allowed to ferment overnight (rice mixed with a yogurt or sour milk). In the morning, ground and stemmed green millet is added along with baking soda. The batter is mixed and dropped in a buttered frying pan. They are served with fresh marmalade (the locals like to sprinkle with sugar). Also, to my great delight, I’ve found donuts! Every country through which I’ve traveled and through discussions with folks that have been in the countries I have yet to visit, there is found a flour based, deep fried thing that is sometimes light and fluffy, sometimes heavy and greasy, but all the time good. Found them on the side of the road back fromTimbuktu, on the edge of the Sahara. Love it. Now if I can just find some good beer here, I’d be in heaven.